When you join our Cabot Stock of the Week advisory TODAY! Only a Few Spots Remain—RSVP Now! ✓ Yes, Tim! I want to see for myself how Spectrum can hand me annual gains of 200%, 400%, 500%. If you’re not 100% satisfied with your results in the first 30 days just let us know and we’ll send you a refund on the balance of your subscription—no questions asked. If you decide to join us on a monthly basis, just advise us when to terminate your membership and we’ll cancel it before the next monthly charge. • Direct access to our Spectrum system, exclusive to Cabot Stock of the Week, which has been tested and proven to cherry-pick the most profitable stocks across all of our seven advisories weekly—even in periods of recession, inflation and market downswings. 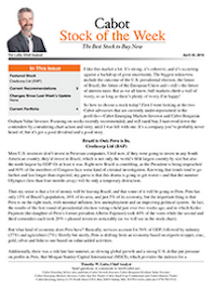 • 50 weekly issues of Cabot Stock of the Week, delivered directly to your inbox every Tuesday. Each issue will bring you the No. 1 stock across all of our advisories without you having to subscribe to all seven advisories and filter through dozens of stocks. • 24/7 access to our private website, featuring the most recent issue and alert, your FREE special reports and forecasts and our archive of past issues and reports. • A subscription to our Wall Street’s Best Daily email newsletter. • Personalized investor relations staff. Should you have any questions concerning Spectrum, our recommendations or portfolio adjustments, my staff will be here to take your calls every day the market is open from 9:00 am to 4:30 pm Eastern time. • Direct email contact with me, chief investment analyst Timothy Lutts. As a member you can write me and get a written response within 48 hours. It’s all part of the special attention you will receive that comes with your Cabot Stock of the Week membership.